Get to know Heroes from the Japanese only Thracia: 776, Genealogy of the Holy War and Binding Blade in the newest Fire Emblem Heroes update. A new Fire Emblem Heroes update features a heavy dose of characters released in Japanese only Fire Emblem games. Eldigan, Lachesis, Reinhardt, Olwen, Klein and Sanaki headline the latest Sibling Bonds banner, which runs from Feb. 27 to March 14. Of those characters, Sanaki is the only one to be playable in a North American Fire Emblem game (Radiant Dawn). The characters launch alongside three new paralogue chapters and additional missions. From my brief experience facing the characters, it’s tough to say how strong any of them truly are. Eldigan’s horse and weapon could make him a powerful red swordsman. He wields the Mystletainn, which accelerates the cooldown of his powerful Growing Light ability. He can also bulk his stats with the “Fury” skill, at the risk of damaging himself after combat. Lunge allows him to swap places with him opponent after combat, which could prove valuable both offensively and defensively. His sister, Lachesis, is a healer with the Solid-Earth balm special. This bolsters your army’s defense and recharges quickly. She can also attack with a weak “Absorb” attack that heals her slightly. All-in-all, she’s not very impressive. Especially when compared to Elise. Klein, the brother of Clarine and son of Louise and Pent, is the third powerful archer to be included into Heroes. He is a pegasus knight’s worst nightmare, because he wields a Brave Bow+. This guarantees he’ll strike twice when attacking, just about guaranteeing that opposing fliers meet their end. He also has the powerful Glacies ability. This boosts his attack by 80% of his resistance stat and requires just 4 turns of combat to use. His brave bow will rack those turns up quickly. Death Blow and Quick Riposte round out his skills, giving him an ungodly amount of power. He’s not Takumi, but he is close. Begnion’s Apostile Sanaki uses the powerful magic spell Cymbeline to deal devastating damage to her foes. Her kit pushes her towards being a supportive Red Mage, however, due to her Hone Attack skill. This, along with Cymbeline, can boost allies’ attack stats by 7 whole points. The thought of using her an Klein together gives me chills. Reinhardt of Thracia: 776 comes with a horse and a blue tome. His Dire Thunder attack acts like a Brave weapon and allows him to attack twice when initiating combat. His Blazing Thunder ability will do massive damage to foes near his target and, although it has a 5 turn cooldown, will be ready in no time thanks to Blazing Thunder. He can also support cavalry units with Goad Cavalry and has Vantage to round it off. I’ll stick with Robin, but Reinhardt doesn’t seem too shabby. Lastly, we have Olwen. She’s Reinhardt’s sister and also a blue cavalier. She can boost her own defense and resistance thanks to her Ward Cavalry skill, which also effects other riders. Warding Blow gives her an additional resistance boost, so she’s sure to crush enemy mages. Reposition allows her to move adjacent allies from danger, and her Dire Thunder is just like Reinhardt. I could see these two working very well together. For more on Fire Emblem Heroes, check out the latest episode of the Nintendo Entertainment Podcast. We’re sure to be talking about this Fire Emblem Heroes update this Friday, so be on the lookout later this week. You can also read my review of the game, or check out what characters we’d like to see added in future updates (part 1/part 2)! This is actually a faint, because she does not have an older brother…BUT…she does have an older sister in the form of Radiant Dawn main character Micaiah, who is a big fan request. 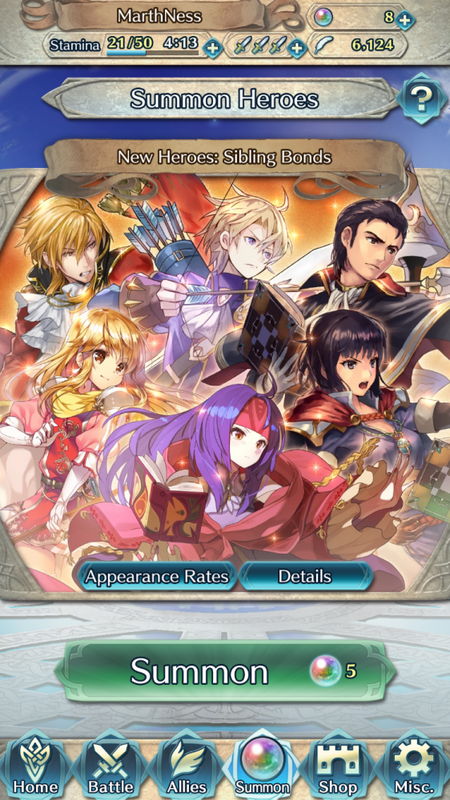 Could Sanaki’s inclusion in this pack mean that more Radiant Dawn characters are coming? Specifically her big sister? Guess we’ll have to wait and see!